Back in 2012, the Harvard Business Review published an article called “The Rise of the Supertemp,” in which the authors declared that any stigma against temporary workers was laughably dated. Actually, they noted, top professionals across all industries were changing the way they structured their careers. Increasingly, they preferred to build a project-based career rather than stick to one corporation so that they could enjoy a greater sense of autonomy and flexibility in their work. The article speculated that this phenomenon would lead to massive changes in the way business works. They were right. The freelancer economy has surged full force ahead and it shows no signs of slowing. By 2020, more than 60 million people in America are expected to work as independent freelancers. More and more companies are hiring freelance talent, and both telecommuting and working on a project to project basis is becoming the norm. Here’s a list of the 10 top online marketplaces for connecting employers and freelancers. Toptal is changing the game when it comes to finding software engineers and digital designers. It’s even where I found my latest programmer. It was founded back in 2010 to respond to the talent shortage in software engineering and the brain drain to Silicon Valley. 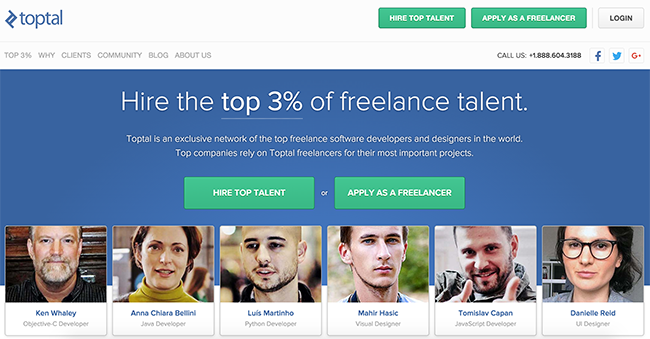 Toptal sources the global talent pool and puts applicants through an intensive screening process. Candidates must pass language and personality tests, in-depth portfolio reviews, live skills tests with senior Toptalers, and complete test projects. Only the top 3% make the cut. When you head to Toptal with a project, they hand-match you to a developer or designer who meets your needs and can start work immediately. Toptal’s the place to go if you need to hit the ground running with high quality assurance and an incredibly personalized experience. Freelancer provides a wide range of services from mobile app development to web design and marketing and it’s one of two sites on this list that are well suited for those with competitive types. It posts your project as a competition, so freelancers submit their work as competitive bids. If you don’t want to do the résumé digging yourself, this is a great way to have the talent come to you. It takes less than a minute to get going and you pay only if satisfied. You may have heard of Odesk or Elance. In 2015, the two companies merged and rebranded to become the supergiant freelance marketplace that Upwork is today. 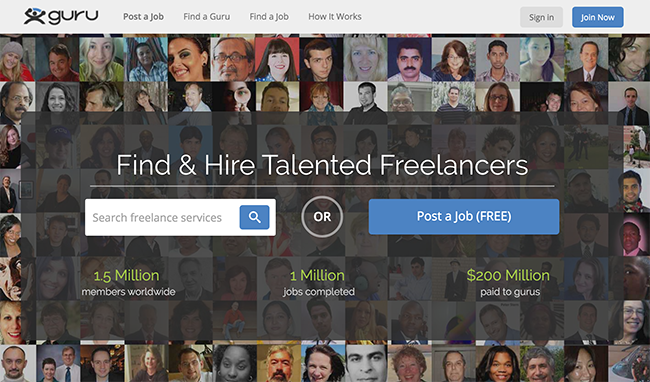 It’s got over 10 million freelancers, 4 million registered clients, and 3 million jobs posted daily. You can browse freelancers by job category or by skillset, and reading the skill directory alone will take you all day. It’s neat, easy to use, and can be your one-stop shop for all your freelance jobs from data analytics to admin support to translations and legal aid. Guru was started in 2001 as the passion project to freelancers access better jobs without having to sacrifice “working their way.” It’s now grown into a network of over 1.5 million “gurus” in all different industries across the world. When you look for a guru, can narrow your searches by location, budget, deadline, and keywords. 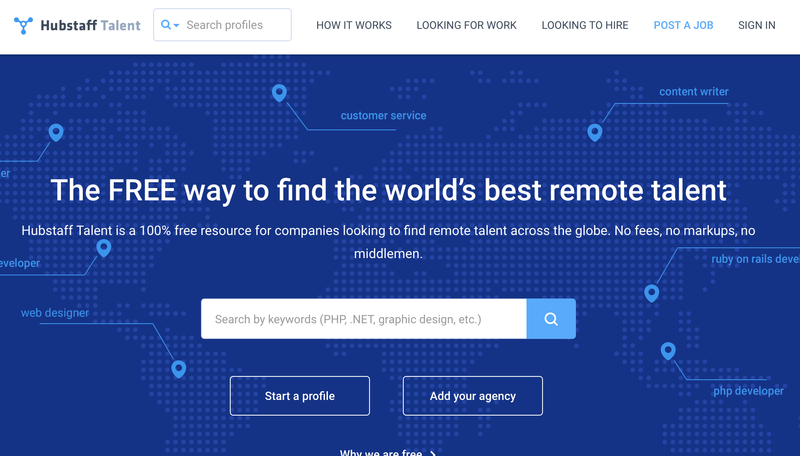 You can search talent worldwide or limit yourself to freelancers in your zipcode and the site lets you decide from the get-go if you want to pay a fixed price or by the hour. You can elect to have your posting featured on the site and decide whether or not you want search engines like Google to show your search as well. One of Guru’s greatest features is that you can filter results by rating and number of reviews, so you can choose to see only candidates who’ve been well vetted by a variety of other clients. 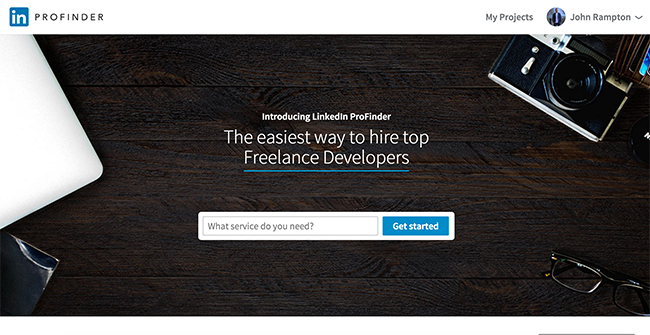 In October, LinkedIn quietly launched Linkedin ProFinder, a job site dedicated to freelancers and employers looking to hire freelance talent. As of now, ProFinder is focused on connecting businesses and freelancers in San Francisco, but it represents LinkedIn’s first dip into the world of contingent work. ProFinder services range from design and photography work to insurance and accounting and it won’t be too long before it expands beyond the city by the bay. As its name suggests, 99 Designs is dedicated to matching employers with designers. 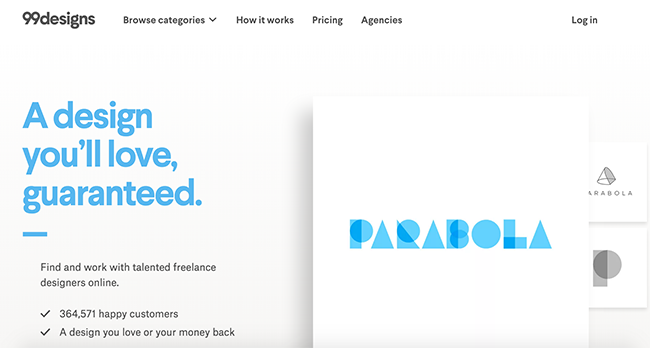 It’s the second freelance marketplace that doubles as a site for competition. Clients fill out an online “brief” detailing their project requirements and aims, choose a payment package, and then 99 Designs launches the project as a contest. Designers then have one week to send in submissions and the client has the opportunity to give feedback and ask for tweaks along the way, or they can sit back and pick a design after the weeklong contest is up. It’s a great way to see a lot of options quickly and to have the assurance you’ll get a finished product in seven days. The downside is you can’t be certain the highest quality designers are going to submit a design for your project. 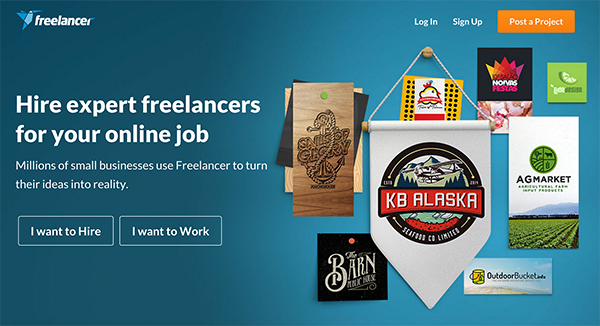 Behance is part of the Adobe Talent suite and isn’t just a freelance site. With over 5 million registered creative professionals, it’s the world’s largest platform for creative exchange, and it functions as a site for broadcasting talent and exchanging ideas as well as finding jobs. It’s job board does a great job at guiding employers to talent they’ll like. Once you make an account, Behance provides custom recommendations for you based on designers and projects you’ve followed. That makes it really easy to browse a lot of great talent and create a short-list of designers with whom you want to work. Simply Hired’s range of freelance jobs might just top Upwork’s. You can find anyone from your next developer to your next gardener or mechanic on the site. You can secure a part-time assistant, a truck-driver, a live-nurse all in the place. You name it, Simply Hired’s got it. With 974 different occupations, it’s the place to go for odd jobs. Today, it has over 30 million job seekers, 6 million open jobs, and 700 thousand employers using its services. CrowdSource is all about helping companies find solutions to their problems by crowd sourcing quality talent. The site focuses on projects related to copywriting, data, moderation, and transcription. Every freelance professional on CrowdSource has passed a series of tests and completed training sessions before becoming part of the network. The team constantly monitors its freelancers’ performance, awarding freelancers with high reviews with increased compensation and exposure to more jobs while restricting any under-performers until they’ve undergone more training. 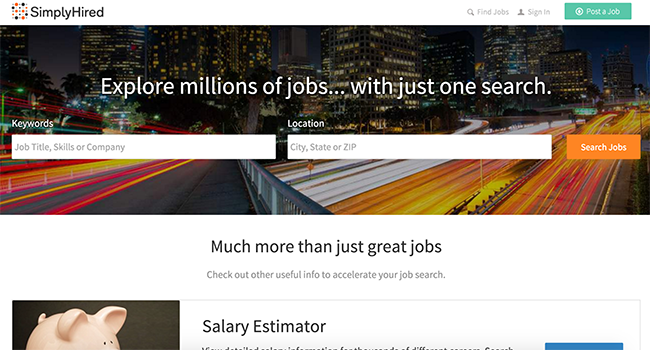 PeoplePerHour is a freelance marketplace for jobs related to running your business on the web. 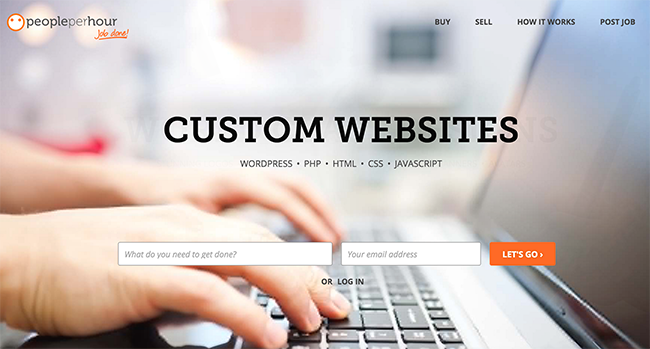 From developers and designers to content and promotion specialists, they’ve got you covered. There are three ways to get started on PeoplePerHour. You can “browse hourlies” which lets you search what’s on offer; you can post a job and the site notifies freelancers with relevant skills listed in their profile about the posting; or, you can search profiles and contact freelancers directly. As its name suggests, every job is paid by the hour and you keep track of all of your payments and job histories in the site’s WorkStream. This lets you communicate easily with your freelancer and make payments a breeze so the job can get up and running fast. Hubstaff Talent is a new freelance directory that sets itself apart from the rest by being 100% free. There are no fees and markups. Hiring freelance talent is a great way to scale your business on a project-basis, but the downside is that it can be hard to secure great freelancers when you need them. That’s where these ten sites step in and make the process a breeze.